It's the weekend! Week one of second semester has concluded. It's nice to be back with my friends and floormates, and I'm liking my classes so far. I'm really looking forward to this semester and I'm hoping that I can find a good balance between work and play! I loved the big, bold stripes that I saw on One Nail To Rule Them All awhile back so I decided to pair it with some bright floral accents. I like the idea behind this one but I wish I did it a bit differently. I think I should have just done full floral accent nails or I should have split the design equally down the middle. Oh well, maybe next time! I used American Apparel T-Shirt on all of my nails to start. For the flowers I used the watercolour technique with American Apparel Manila, American Apparel Poppy, and American Apparel Sunset Blvd. I did the same for the leaves with American Apparel Malibu Green. I did the black stripes last using a black striping polish, filling in each block with American Apparel Hassid. Thanks for stopping by and I hope you have a lovely weekend! NO NO NO you should not have done it differently! these are so cool and original! 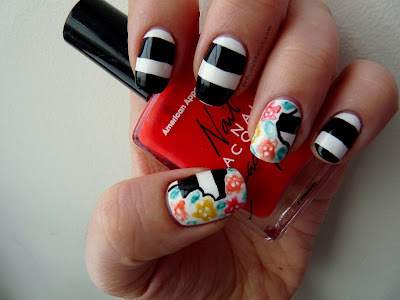 i am seriously in love with those accent nails, i may have to copy you immediately. I like how this turned out, very creative! And I like especially the combination of stripes with flowers. Your freehanded stripes look great, I need to work on mine. I LOVE these, you definitely shouldnt redo them! These nails are so cute!!! I'm in love with them. I like the stripes peeking out from behind the floral, these are pretty!